spindly to properly support himself. But it is the eyes that mark the biggest difference between the two paintings. In Goya's dark shadowy backdrop, the only white is Saturn's eyes, to which the viewer's own are immediately drawn. The fact that the sclera (white part of the eyeball) can be seen above, below, and to the side of the iris (called sanpaku eyes) is a subliminal, evolutionary cue of madness and impulsive violence. Ever wonder why Charlie Manson's gaze is so unnerving? You may not have been able to rationalize it, but it is his exaggerated sanpaku condition that intuitionally triggers a deep-rooted danger instinct. 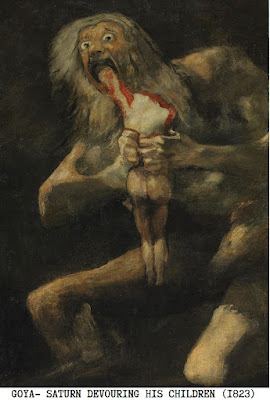 Equally disturbing, Goya's Saturn is not looking at his victim, but seemingly staring right off the page at us. One of Saturn's brows is tilted upward as if asking the question, "Who am I, and why am I doing this?" perhaps implicating us as conspirators in his crime against humanity! Goya, too, could have depicted the human victim in grand distress as Rubens did. However, there is no arterial spray, or limbs splayed akimbo, suggesting of any struggle. There also isn't a hint of tragedy in the picture. Saturn's unfortunate quarry is secondary in the composition; in fact, a case could be made that she is actually complicit in the act. Is she willingly offering her left arm up to be eaten? The monster lore I choose for Playing Dead is the devil-monkey of New Hampshire, a local legend of an aggressive, yet shy primate running around in the woods. Naturally, the few reported sightings have been unrecorded and unsubstantiated. I added a few cosmic elements to make the creature reminiscent of the bushy-haired sentient Saturn. While my narrative obviously references the depicted Goya scene, it also grapples with the existential struggles related to time (Cronus). What do we do with the limited days we have? Are we living according to our will, or simply to please someone else? And are we overly agreeable, playing life too safe? 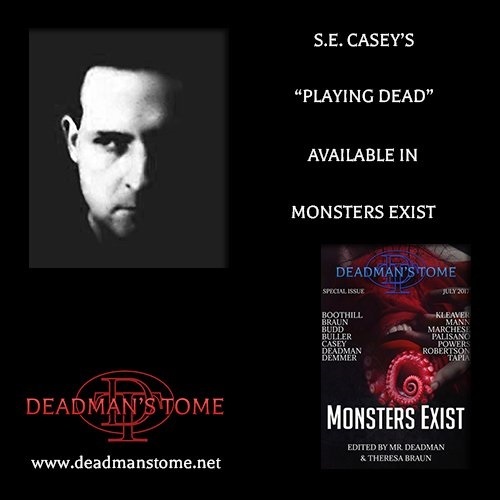 Monsters are everywhere in this sense, the external representations of things we internally fear, man's hobgoblins, bugbears, strawmen, and other bogeymen. I like the symmetry of Monsters Exist having fourteen stories, as well. Goya's Saturn was one of fourteen works he painted directly onto the plaster walls of his famed villa, "The House of the Deaf Man".